In the sci-fi dreams of the 1990s, virtual reality headsets transported us to other worlds. Now, top real estate firms and developers — such as Halstead Property, Greenland Forest City Partners and Douglas Elliman Real Estate — are hoping to use the technology to transport potential buyers to a place of yes. In order to gain a competitive edge, real estate firms are splashing cash on the tech to woo buyers, but it remains to be seen how well it work or how transformative it will be for the industry. Proponents say it will make house hunting more efficient, eliminate open houses, and could make relocating easier by giving buyers the opportunity to visualize a development. Halstead tapped Virtual Xperience to create virtual renderings of a four-story building in Astoria that has yet to be built. Using an Oculus Rift headset, a potential buyer can “walk” around the building. The company hopes the experience will spur buyers to plunk down the asking price of around $2 million before ground is even broken, the New York Times reported. 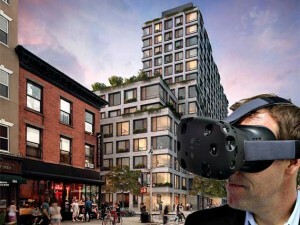 Greenland Forest City Partners will use virtual reality to sell condos for 550 Vanderbilt in Pacific Park Brooklyn. Customers will be able to take a virtual tour of the eight-acre public park around the 17-story, 278-unit development.